“Energetic hubbub” is a positive description for a restaurant. A “noisy” restaurant is another story. If your patrons strain to be heard during conversations or your waitstaff needs to shout to kitchen staff, then noise control treatments are necessary. Basically, patrons should be able to converse quietly without interference from the neighboring table. Each table needs to feel a sense of privacy. 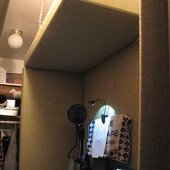 Sound bouncing off hard tables, untreated floors, bare walls and ceilings creates excessive reverb, or noise. Acoustic sound control treatments will help reestablish conversational clarity and patron privacy. Acoustic Panels will help reduce reverberation across all types of establishments. They can be mounted in discreet areas, such as the ceiling so as not to interrupt the existing design. Alternatively, panels can be mounted in a collage or pattern on the wall by using an assortment of panel sizes and fabric colors. Art Acoustic Panels printed with various images or photos can blend in with and enhance existing themes. 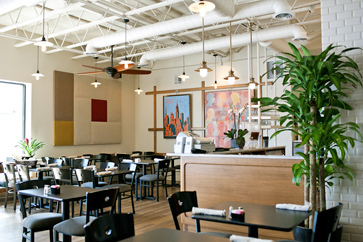 Other options include Acoustic Baffles that hang from the ceiling, 4" Acoustic Panels suspended from the ceiling, or Acoustic Coffee Bag Panels, which offer both a unique look and a complimentary addition to any cafe. I can’t thank you enough for getting the panels in my hands so quickly. Thanks again to you and everyone at ATS for a great product and service.